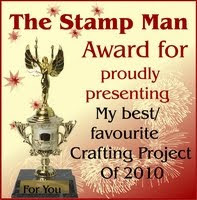 The Stamp Man: THE STAMP MAN BLOG HOP, CANDY AND AWARD EVENT! I hope you’ve all had a great Christmas and are ready to have some more fun along with a chance to win prizes. There are 16 great prizes to win, one on each of the blogs you visit on the hop! There are 2 things to join in with, the Blog Hop, and the Awards, they are separate events. To avoid confusion the details are in separate posts. I hope you will be able to join us for both. 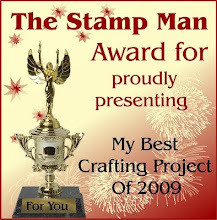 Look for THE STAMP MAN BLOG HOP, CANDY AND AWARD EVENT title on each of the blogs you visit, as there may have newer posts added to the blogs during the week. (Look for the title in the blog archive list or scroll down to find it). Each of the featured blogs will have a code, (a letter) that you will need to write down. Leave a comment, then hop over to the next blog, continue in the correct order to find the answer. If you get lost along the way, come back to The Stamp Man blog and start again. Once you have completed the blog hop, please email me at thestampman@btconnect.com with your answer. To be in with a chance of winning a prize you must leave a comment on EVERY blog you visit in the blog hop. If you get carried away looking through the work on the blogs you visit and run out of time to complete the hop that day, make a note of where you stop and start again another day. You have a week to complete the blog hop, there is no rush to get to the end, enjoy the journey and admire the scenery along the way! The blog hop ends at midnight (GMT) on Sunday 3rd January. You won't know what the prizes are until you start hopping along! Each blog has been allocated a prize to tell you about as well as a letter code. Once the hop is over, I will list the names of people who have won a prize to ask you to email your address to us so we can post it to you. The prizes will be allocated randomly to the winners. Before you go, don't forget to leave a comment under this post! Have fun, and remember to call back here to take part in the awards too! (See the next post for details, and post your award entries there). The blogs you will be visiting on the blog hop will also feature the best/favourite projects the ladies feel they have made in 2009 for you to enjoy along the way. For doing this they too will receive the award! This looks so fun!!!! I really love how we have a week to complete the hop. And A prize on every blog! wow! I love that suitcase too Jill. It's gorgeous!! You do know how to wake us all up from the Christmas over indulgencies. Great idea to get our crafty minds back into gear. Absolutely gorgeous concertina book. Just love the colours and the beautiful coppery tags. Great idea for a blog hop too as it's so inspirational looking at other bloggers artwork. Hi there. This is a fantastic work of art, hours of dedication and work went into this masterpiece. Well done. Here we go. I can't get to the table to use any of my new crafty stuff at the moment, so this is an ideal distraction. (And a source of inspiration for when I can take over the table ...) Thanks! Shouldn't be here got so much to get done but couldn't resist popping in. That project is just gorgeous Jill - will have to check it out further. I've been really looking forward to this! Thanks for some real post christmas fun. Love your suitcase - so beautiful! wow! i love blog hop. I really liekd this project and remember it being posted, a spuerb keepsake. Off to hop now. I'm going to start my blog hop... sounds so fun! What a gorgeous concertina book. I hope you had a lovely Christmas with family and friends. Thank you for the chance of winning this blog candy. I would love to be in with a chance of winning as I would put it to good use for my cards that I make to sell to raise funds for different charities. Here’s wishing you and yours a Happy New Year. Very cool project!! Looks like it was a lot of fun to make! I've never tried Moonglow products, so if I win, I'll have lots of fun experimenting! Thank you! I love the concertina book. I will have to give that a go when I get a chance! How exciting!! Just what I need to see me through this afternoon whilst the kids are hogging the telly!!! Love your blog, so inspirational. Hi Jill. The hop seems to be going very well. I've had lots of lovely comments so far. Your suitcase project is brilliant. One of my new year resolutions will be to try more non-card projects, so I will certainly know where to come for inspiration. I have one of those suitcases - now where did I put it? Love yours. Thanks for the blog hop - these are fun and what a change from watching tv. What a fun idea for the Christmas holidays - hope you all had a good one and all the best for the New Year to you all!!!! Will get started now then! I love that suitcase . And I love blog hop. Looking forward to see all the creativity..
What a lovely idea - this is the first blog hop I have participated in. Hope I make it to the end! Love your project. First blog hop hope I manage to get to the end !! Great work on your blog. Excellent way to get ourselves into gear for the start of the New Year. I jsut finished the blog Hop...now to figure out the word!!! Hummmm. I will be emailing you. Thanks for a great Blog Hop! Love the project too.. will have to find some 'me' time in the new year for that one. Thanks Jill - after all that lovely food, I'm doing a bit of hopping to lose some weight! Love the concertina book/suitcase - fabulous! Well this should be fun to check out everyones creations. Love your concertina suitcase. Yeah!! can't wait to get started. Love the Concertna box. Oops i forgot to leave a link to my best project for 2009. Love the book/suitecase and it will be hard for me to pick one project to showcase for they all have been given as gifts to some very deserving people. I think I have pictures (I hope I have pictures)! I've never done a blog hop like this before. This is going to be fun! I have been looking forward to this blog hop, they are so much fun. Morning Jill, so pleased to see the hop is going so well and I'm lovin' visiting all the blogs. Love your project by the way. I love your project, I got some of those concertina's book's from the NEC a few year's back, and used one to make a new baby card for my neice, sorry to say this was before I found blogland, so no pic's to show for it. Thought the suitcase was a great! Off on the hop! Just about to start on the hop and it looks like fun! I have never been on a blog hop before, so am very excited about starting this. Looks good fun. Love that suitcase, very clever. This hop looks like it is going to be a blast!! Can't wait to get started!! 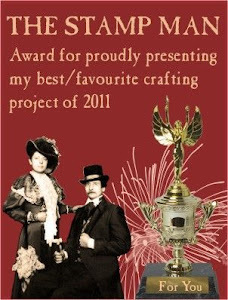 I also joined in your 2009 award! I know were only supposed to pick one, but I had three that were equal!! LOL!!! Thank you for both of the lovely ops!! ZFollowing you along! WOuld love ifyou would hop on over and follow me too!! Thanks for all of the fun! What an interesting thing this Blog Hop has been. Never gone on one before but found this very inspirational and great fun. Great project. I love blog hops and thanks for the chance to win. What fun, this is my first blog hop! Off I go to explore! love this idea - never done it before - fear it could become addictive! A blog hop. What fun! I'm sure it will be an exciting journey! Love the suitcase BTW. I just love moonglow products. The first of the glorious shimmer I every owned. Love blog hopping especially when you have plenty of time. Great fun. Hoppitty hop hop....on your marks get set go.....Santa brought me a computer for Christmas so now I can join in....hoppitty hop hop! Hop, hop hop...love your case, hop, hop, hop! oooh, i LOVE a good blop, and your concertina case is FANTASTIC! i can see why it would be your fave!! What an adorable case! I can see why you picked it as your favorite. Looking forward to this blog hop! Wow what a fabulous project. I love blog hops so off I go. This sounded like so much fun, I just have to take a peek and play along. I love your favorite project. Looking forward to this hop! Have got wrapped up to keep warm, and off I go.....! Hi Jill, just got home from a trip to my mum's for Christmas and got lots of blogging to catch up on - but am going to get distracted with your hop first! Great fun... off I go. Well, I've made it back to the beginning. It's been fantastic fun and a great way to see lots of new blogs. Thank you for the hard work. Hello, my first Blog Hop & looking forward to visiting all the new Blogs. Your book/suitcase looks amazing by the way! Fantastic project - I love the colours in it. Off to hop now - better late than never. Wow that was great fun. There are some awesome projects on this hop and a wide variety too. I loved it. I'm now off to choose my fave project and will be back to post it later. I will also email the phrase. I loved this as soon as I saw it in Port Sunlight - beautiful work - lots of inspiration. My first blog hop too - I must get into this in the new year! Lets see if I can do it in a day! A fantastic start for the New year ! I hope I make it all the way throuhg without being distracted ! Been meaning to do this hop since it started and never got round to it. However, I have a spare hour or two so going to have a blog hop session! It's a fabulous creation, a great keepsake ! Happy New Year to all, love your work, thanx for the Hop! Just finished the blog hop, got half way through and had to stop for a video call for my mum and dad who live away and they wanted to see poppy, but finally got there in the end. Your DT must be so proud of their work for 2009 as they were all superb. Love your little suitcase too! I'm off to email you my answer for all the letters, so I'l say good bye! Thank you for the blog hop, its brightened up this cold and miserable sunday for me! Do love the concertina case.. must visit your shop again soon. Hi Jill, I've not had a minute this week until now so I'm going to try getting round the hop. I'm going to enjoy this blog hop and all the inspiration along the way, thanks for arranging it. Happy New Year to you and your family, all the best Teresa. Wow, that's taken me all afternoon Jill and I didn't stay as long as I would have liked on some blogs, but I will go back. It's been great fun and I'm off to send my email now. This is the first blog hop i have done. Love the suitcase. I love blog hops. Off to make a start now.